Are You Making The Most Out Of Your Coconut Oil? Spring, Summer, Autumn or Winter no matter what time of the year it is the investment of Vita Coconut Oil is worth every penny! You may be thinking why am I writing a post on coconut oil when it’s been around for ever and you probably already have a tub in your cupboard that you cook with…but are you making the most out of your tub of coconut bliss?? I prefer to cleanse my face using either a balm or an oil based product, that is until I went away for a weekend break to find I had forgotten to take my cleanser with me! 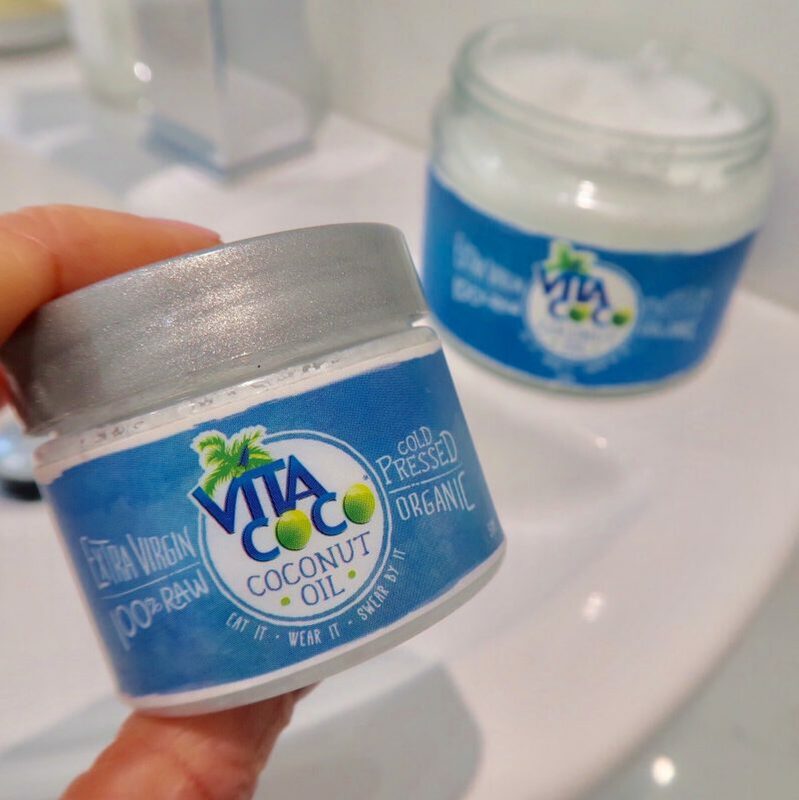 However I was thankful when I came across my cute travel size pot of Vita Coco floating around in the bottom of one of my beauty bags (I tend to take 5 beauty bags with me everywhere I go!!). Using a 10 pence amount I massaged Coconut Oil around my face and eyes before taking a warm flannel and instantly removing my makeup with it without stinging my eyes. Following on as I normally would for a second cleanse to really clean my skin and remove any further unwanted dirt and grime, leaving my skin instantly hydrated and clean. An added bonus to using such product on your face regularly is the glossy nourishing effects on your lashes, helping them to strengthen and soften the skin. After my forgotten cleansing experience I decided I would use my pot of dreams for everything! I switched up my night time facial oil for coconut oil and found more then the obvious results that would be expected. I had a few mismatched skin concerns, from bumps on my chin due to over stimulation from a new mask I was testing, to extreme dry skin on my forehead (a regular occurrence) and dehydration around my eyes. After a double cleanse and a sweep of ‘Alpha H Liquid Gold’ I laid in bed where I finish my usual evening facial massage. By the morning I found the bumps had disappeared and the dry skin was treated overnight, this is down to the many powerful properties you’ll find in Vita Coco – Antioxidant, Antibacterial, essential fatty acids and natural coconut oil. I am always telling both my clients and friends to exfoliate the skin all over their body every other day. Although it seems to be a forgotten process by the feedback I get (who’s got time for that in the mornings, or i just don’t remember!) but when panic sets in that summer is around the corner or your friends wedding is at the weekend, or you have a Friday night date, is when you remember that you haven’t looked after the skin on your body since last summer! Your skin is designed to slough off its own dead skin cells every day, however the natural process can be a little slow and leave you with dry dead cells hanging around on the surface (slapping on a last minute tan or creams and lotions will just not do, this will only enhance the unwanted skin cells) So while your taking your daily shower mix a tbsp of salt or sugar in a small pot with 2 tbsp of Vita Coco Coconut Oil to blend your own natural at home daily or weekly skin exfoliator. After a few weeks you’ll notice a huge difference in your skin condition, from the skin tone to the complete relief of those pesky dry bumps that lay on the surface known as Keratosis and finally total skin maintenance including the smoothest softest skin you’ve ever felt! The beauty industry is ever changing and skincare is at the top of our list, but what about the skin all over your body? I literally couldn’t walk out of the door without smothering my body in some sort of cream, lotion or oil without feeling like something was missing! Taking daily showers, sometimes twice and using fragranced gels each time sets our skin up to losing its natural oils resulting in constant dry and dehydrated skin. Following this we wear tight and rough clothes making the skin wear out even more. The answer and reliability that comes from lathering coconut oil into your skin each and every time you jump out of the shower will not only resolve your dry issues but also rebuild your skins natural protective layer boosting your hydration levels and enhancing your blood circulation through the circular massage technique needed to apply, don’t forget to massage into the soles of your feet before applying cosy socks to hold in all the goodness before bed. I’m not a massive fan of hair masks as my hair is really fine, so it tends to cling onto excess oils for longer. However I was pleasantly surprised to find that the fine consistency and tiny molecules of coconut oil seemed to be lapped up by my hair letting the goodness nourish my dry ends. I also found it easy to rinse out with a double dose of Charles Worthington Micellar Shampoo leaving my hair happy, glossy and healthy. I posted ‘Bullet Proof Coffee’ on my Instagram a few weeks back after a friend told me about a new recipe. I have found it to be the best homemade coffee for a long lasting energy burst, whilst the antioxidant coconut benefits get to work inside the body, definitely worth checking the recipe out on my insta. Finally … Pick up their cute 50ml travel pot for holiday hydration, and all the above while your away!